Professional children's entertainer Freddie Fantastic presents a "STRESS FREE" full-party-package, with magic, laughter and fun. You relax and enjoy a stress free party whilst Freddie Fantastic entertains the children. Our birthday child is made to feel like the true star on their day. Freddie has been making children laugh for over 20 years so you are guaranteed a truly special experience that you and your child will never forget. A full two hours of interactive fun, hilarious age appropriate magic show and a childrens discocomplete with sound system and flashing disco lights. Your DJ is a professional childrens entertainer who gets the children interacting having a ball playing interactive games set to popular music. The children’s disco and magic show is an interactive musical dance experience mixed with an amazing magic show, comedy and balloon animals designed especially to entertain children aged 3 to 8 years old. With over 8000 successful performances over 25 years we have perfected the formula ensuring the ultimate magic and mobile kids disco in Cheshire and the Northwest. Everything is included and your entertainer even supplies the prizes. The stress free package takes care of keeping the children happy and leaves you free to enjoy the party. Freddie Fantastic is a professional children’s entertainer and magician with over twenty-five years’ experience and he designed the magic and kids disco package. The entertainment starts as the kids arrive kicking the party off with interactive musical games. This allowing your party guests to join in as they arrive. Having the children entertained and engaged from the start ensures there is activity, action and a rocking party atmosphere right from the beginning of your party. The two hour full party package offers the best of both worlds as it includes the most mega children’s magician show ever. The magic show is age appropriate and is jam packed full of magic, comedy, balloon twisting and fun. All the entertainment is taken care of leaving you to enjoy the day. The birthday child is the star of the dance party and magic show. Have a stress free party, the package even includes the prizes. 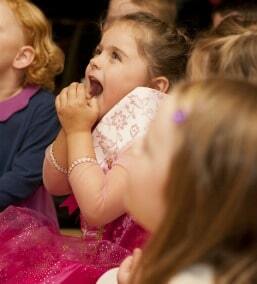 Book a show you know the children will love and make your party a sure-fire success. "Pippa was crying from laughter at times and keeps coming up with different "favourite tricks ". All the children - even my older girls - and the parents couldn't stop laughing. A great time, fantastic professional service and some great pre-party advice. I will definitely recommend you to friends and hope to see you again in the future!" This is a fully interactive show designed for maximum participation; the children shriek with enjoyment as they take part in inclusive action games and dance set to disco music and flashing lights that the children love. "I would just like to say thank you so much for such a fabulous party! Keeping almost 40 children entertained (and the parents!) for the whole 2 hours was just brilliant! A good handful of the parents have commented saying you are by far the best children's entertainer they have seen. I most certainly agree with that! Cameron keeps on asking if we can have you again this weekend for another party!!" Magic 4 Children shared Sarah Hall's post.